Pour your heart and soul into one of the simplest weight loss plans on the planet. How eating bananas on a diet for breakfast can change your outlook on losing weight. 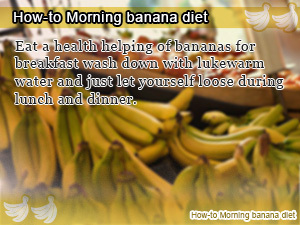 Whereas most weight loss plans make you go bananas on a diet, the morning banana diet may be an exception. Beyond the reach of the buzz stirred up by national banana shortages in Japan lies an honest to good banana diet. Is eating only banana good for weight loss and your diet? Substituting your favorite bacon and eggs breakfast with a healthy banana followed by a warm glass of water is possibly the easiest weight loss plan that gets results where other eat until you drip fail. On the morning banana diet you can eat all you want after breakfast taking away all the strict dietary restrictions that make it hard to continue dieting. In addition to being one of the most ingenious weight loss plans there is, the banana diet gives your bananas of benefits to go along with shedding off unwanted pounds of weight such as easing constipation and detox to cleanse your body making losing weight and getting slim something you can achieve with hard work and perseverance. In this next Slism we will explore how the morning banana diet really works from the ground up going into detail on the benefits you get from eating bananas on a diet and just like other weight loss plans, make it last so you can stick around to see the end results of your weight loss. 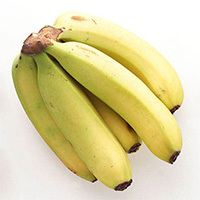 The morning banana diet is where you eat bananas and drink water for breakfast relaxing your eating habits during lunch and dinner without applying diet restrictions that is said to be accompanied with less hunger and diet associated stress than other weight loss plans. Eat raw bananas chewing thoroughly. By eating cold frozen bananas you risk lowering you core temperature. Cooking bananas destroys important enzymes that make the banana diet so attractive as a weight loss method. 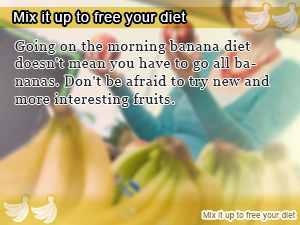 However, when you are just not feeling in the mood for eating bananas substitute another fruit in place of a banana. Drinking water while eating bananas helps resolve hydration issues. A good rule of thumb is to drink water that's been left out in the open for more than 15 minutes given enough time to come into equilibrium with the surrounding environment sharing temperatures with the room. For people with the chills, drinking warm water is okay too. Note that it's important to develop a working habit around getting hydrated throughout the day to get the most out of your diet. Besides breakfast there are no restrictions on how much you can eat during lunch and dinner. For the most part you should eat as you would usually after breakfast not worrying about micromanaging everything you eat. On the other hand, if you are looking to better the results of your morning banana diet, then making healthy choices always keeping nutritional balance in mind is key the key to losing weight eating bananas. Watch what you eat and eat dinner at the very latest 4 hours before calling it a day going to sleep. Bananas are an excellent source of potassium, magnesium, and vitamins that help keep your skin looking good, strengthen your immune system, and even reduce edema leg swelling from making your legs look fat. The banana diet has so much to offer to your health and weight loss. 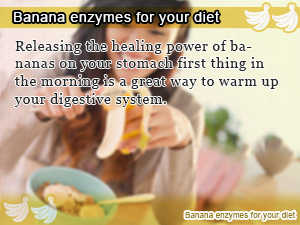 Banana enzymes help push out bodily waste toxins cleansing your body making it easier to lose weight. In addition fructose and dietary fiber help get rid of constipation boosting your metabolism making you less prone to putting on pounds off fat. Bananas are an easy to digest health food. That is why by only eating bananas you can ease the burden your diet has on your stomach allowing your stomach to pick up the pace in your larger portion meals. The reason why eating bananas in the morning works is that as you sleep your stomach rests. By eating only a banana in the morning you give you stomach more time to relax improving on digestion and nutrient absorption. Bad digestion and nutrient absorption not only make it easy to get fat but can trigger abnormal conditions in your body. By carrying out the morning banana diet you give your digestive tract time to get on top of your body. What is there to worry about when you can eat as much bananas as you like during the morning and not worry a thing about calories in the afternoon and on to the evening. The morning banana diet has got to be the least stressful weight loss program out there. In addition, you don't have to peel your bananas cutting them into pieces which make them even more portable when time demands more in busy mornings always on the go. As good as the morning banana diet is in terms of your diet, beauty, and health most people who have actually tried the morning banana diet say that it gets old after a while. No diet is perfect and so isn't the all banana diet. One word of advice for anyone wishing to succeed in the morning banana diet is that you don't force yourself to eat only bananas incorporating other fruits into your morning breakfast routine to avoid going bananas on the banana diet. Even if you are not interested in the banana diet, one thing you take away is that the secret to making your diet a success is in building flexibility into your diet. Only then can you enjoy your diet losing weight without forcing yourself. Eat a health helping of bananas for breakfast wash down with lukewarm water and just let yourself loose during lunch and dinner. Releasing the healing power of bananas on your stomach first thing in the morning is a great way to warm up your digestive system. Going on the morning banana diet doesn't mean you have to go all bananas. Don't be afraid to try new and more interesting fruits.